As a Bahá’í parent of young children, I am always looking for picture books with beautiful illustrations and high quality printing that also explore some aspect of Bahá’í life in their subject matter. A tall order? Yes! There are not many to be had. The creation and publication of children’s books specifically for Bahá’í readers has only just begin. 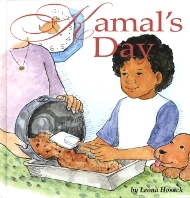 But as a parent of young children, I eagerly anticipate the publication of such books, and I was thrilled when Leona Hosack’s Kamal’s Day, a time-telling book written for children from pre-school age to first grade was published, and I could read it to my children. Kamal’s Day is a charming book. The story is appealing and the illustrations not only vividly rendered, but also engaging and purposeful. In nearly every illustration there is either a clock face or a digital clock. In an outdoor play scene, the artist even sneaks in a sundial. As we walk with Kamal through his day, we learn what time he wakes up, what time he eats breakfast, what time he plays with his friends and more. All the events of Kamal’s day are the sorts of things with which most young children are familiar. But here’s the difference: in addition to doing these things, Kamal also attends a weekly Bahá’í children’s class and engages in service, such as visiting an elderly neighbor to share an art project he has completed. Kamal also helps his parents make special granola bars to serve at a Bahá’í study circle to take place that evening. This is a hands on book. In addition to the story and delightful illustrations, activities are offered at the back of the book, where directions are included for an art project appropriate for a children’s class and for making the very granola bars Kamal prepared for the feast. Kamal is an excellent role model for Bahá’í children. Kind. Energetic. Spiritual. And he is fully engaged in serving his family and his community. And let’s face it, he is as cute as a button. Just the sort of protagonist parents want to see in a picture book to read to their children — while teaching them how to tell time.